Seamus: Today we're checking out a personal friend, the prolific maven behind Shattered Stitch Cosplay. She's done Black Cat, Jinx, and Vampire Agnes, among many many others. How are you doing, Shatter? Black Cat, NoFlutter Version. Photo by Bob Edens Photography. Shatter: Doing well. Just got a new batch of photos in - so I'm gleefully looking through some great shots of new costumes (and some oldies, but goodies. Seamus: Got any of the new ones you really really like? Shatter: There is a STELLAR shot of my new Agnes cosplay (of Bravely Default) that made me stop scrolling. I'm pretty proud of it - but its the photographer who should truly be praised (Bob Eden's Photography). He caught the shot, I just kinda stood there, lol. Seamus: Holy crap, that is fantastic! Wow! Have you worked with him a lot before? Shatter: Sure have. He's local and is a total hoot. My schedule is always bananas, so nailing down a time to get photos is hectic at best - but when we get a chance, i load up a whole box of costumes and shoot a lot at once with him! Seamus: You have a pretty prolific record. How long have you been doing cosplay? Subquestion: What got you into it? Shatter: About 15 years now, if math serves. Fashion actually got me into it. I was modeling and loved the creation process of garments and the creative artistry of that. I was super into fashion - and a friend took me to a small localish con and introduced me to cosplay. I was instantly enamored - it combined something i was deeply interested in (fashion) and my other interests like gaming and comics. It was a natural fit. Seamus: Seems like it. Fifteen years... wow. That's some significant experience. Anything you've learned along the way that you'd like to share with some readers looking to get into it, or getting their feet wet? Shatter: Do it for you. The ship has sailed on doing it for money. Disregard the community. There are plenty of bad apples that ruin the community by aiming to crawl over people to be on top - whatever that means. There is no "winning" at cosplay - but some sure seem to make a competition out of it. If you're cosplaying for fun, don't take it too seriously. Don't take people or the internet too seriously. As long as you are having fun and not hurting anyone, you do you booboo. Seamus: You do you. That sounds like great advice. Taking a step back a bit, you said that your schedule was insane. What do you have going on lately beside cosplay? Shatter: I have a job that is a bit two fold - working for a web dev company whose owner also is opening a theater tonight [Friday] - so getting all the ducks in a row for the grand opening has been a push. 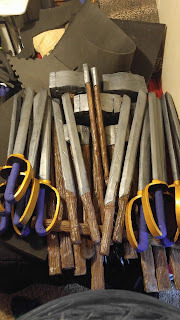 I also larp - I play several games and staff one, so that's pretty demanding as far as time and resources. Next week I have the annual Gala that we throw for ConNooga - a big nerd prom for cosplayers, larpers, and anyone interested in coming out for a fun night of costumes. We are finishing everything up for that and ticket sales are about to end - so hopefully next week will be mostly finishing my costume and answering questions for folks. Dragoncon is also coming up - so trying to finalize costume builds is on the list, although its due date is a ways out. Seamus: That sounds like a hella full plate. How do you manage it all? Shatter: I've got a great friend circle. My little slice of the community that I hold close is very supportive - always willing to help and lend a hand. I wouldn't be able to accomplish near as much as I do without my team of go-tos. Seamus: Community is everything, right? Shatter: Well, it can be. When its not eating itself. People always want to try to tear down the successful. its not a new thing. at this point its like wonder woman deflecting bullets with a bracer. Deflecting with one arm, drinking coffee with the other. Okay, final sprint. Three questions, answer as quick as answers come to mind. You ready? Shatter: Yep, go for it. 3) Maim one, marry one, elect one president: Lex Luthor, Solomon Grundy, Dark Helmet. Seamus: Awesome. Thank you so much! Find Shatter on Facebook here, or follow her on Twitter @ShatteredStitch. Jinx from League of Legends. Photo by Bob Edens Photography.